Nestled thirty miles north of the New York metropolis area lies a tiny village blanketed by a legendary literary lore. Nearly two hundred years after Washington Irving brought to life a certain headless Hessian on horseback, the small settlement at Sleepy Hollow, New York celebrates its haunted history in full glory every October. 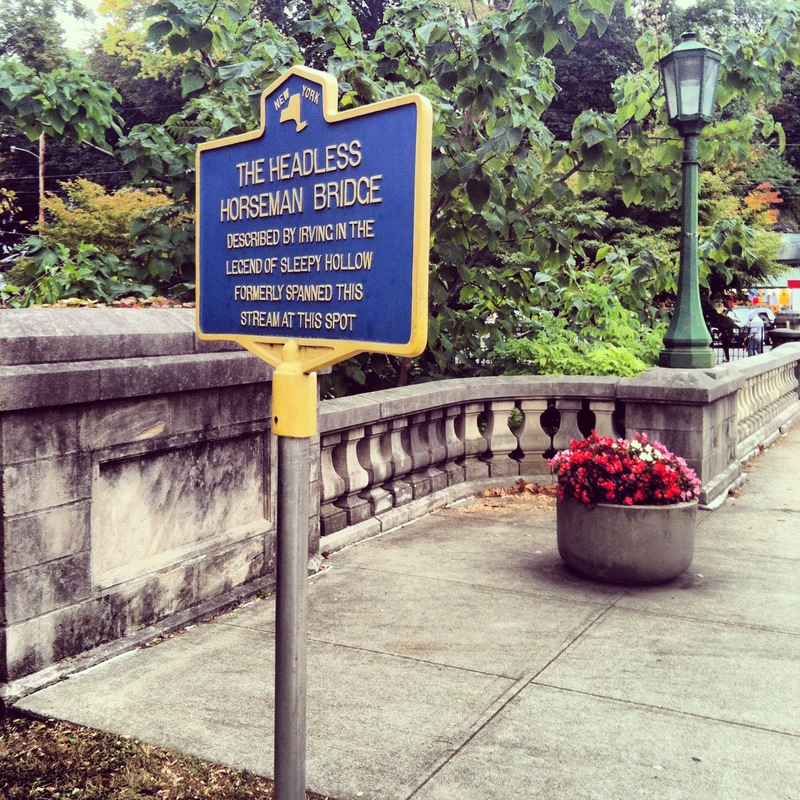 Last year, upon discovering just how accessible Sleepy Hollow is (travelwise), I had to check it out. I toured Washington Irving’s estate at Sunnyside for The Legend Behind the ‘Legend,’ a program offered on top of the normal house tour in which my companion and I were treated to a shadow-puppet performance of The Legend of Sleepy Hollow and a storyteller-guide’s hike through the woods on the property. Simply stated, I was smitten. House tours are already my favorite (as my previous post attests) but the appreciation and reverence the staff on site at Sunnyside have for their writer-(formerly)-in-residence really impressed my inner English major. Here, I learned of Irving’s influence on New York culture (he introduced “knickerbocker” to the American vernacular, which eventually became the namesake of the city’s basketball team) and was taught to really appreciate the humor and subtleties in the Legend itself, and especially of its dubious was-he-really-a-victim central character. Irving himself was an influential and important author outside of his ghost tale for which he is famous, and the tour of Sunnyside is a most excellent daytime activity any time of the year really. But there was one point in which I experienced the most profound disappointment. All of the Autumn nighttime festivities are wildly popular, and since last year I traveled on a whim, I was essentially locked out of any of the other performances or attractions. So, this year, I decided to go back. The Historic Hudson Valley website is a great resource for seeing all of the great things there are to do in Sleepy Hollow and the surrounding area during Halloween month. For my return trip, I booked a performance of Irving’s Legend, and the attraction I was MOST EXCITED for: The Great Jack O’Lantern Blaze. My companion (again, my brother) and I arrived a few hours before the Legend performance and so we decided to grab dinner and explore a bit. Tarrytown and Sleepy Hollow are both very tiny towns, serviced by one main road, Route 9, which can get pretty congested. We found the food options to be more plentiful in Tarrytown along its Main Street, which runs perpendicular to the river, just off Route 9. After enjoying a delicious burger at Little B’s, we headed for the Old Dutch Church, next to the Sleepy Hollow Cemetery. The Old Dutch Church is the perfect setting for the one-man storyteller performance of Irving’s Legend. Featured prominently in the Legend of Sleepy Hollow, The Old Dutch Church lives up to its adjective. It’s old. It was already over a century old when Irving included it in his text. 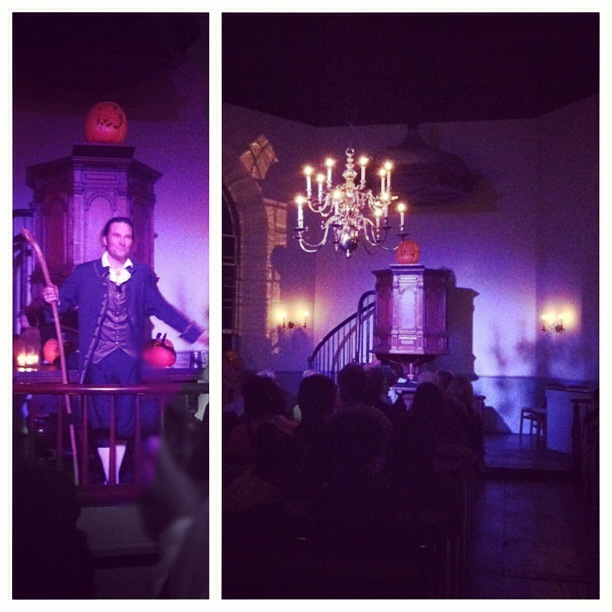 For the performance, the interior was festooned with carved pumpkins and lit by a candle chandelier. An organist supplemented the story with spooky sounds, while the cemetery’s headstones loom just outside the windows. The storyteller, Jonathan Kruk, delivered an hour-long interpretation of Irving’s short story, rooting everything in the literature to its actual place, which was thoroughly entertaining. I half-expected (okay, half-hoped) to see the Headless Horseman himself galloping across the horizon at the conclusion of the performance. 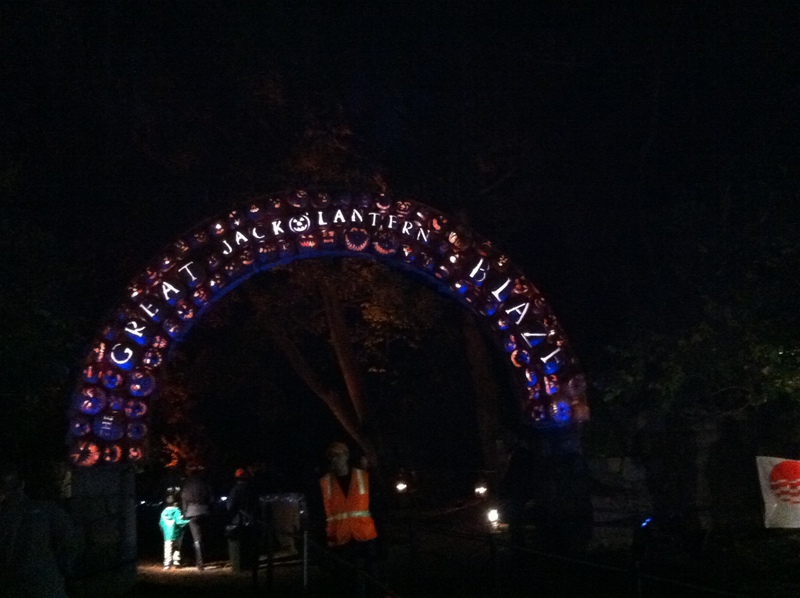 From there, we drove the approximately ten miles to the Van Cortlandt Manor for our 9:30pm timed entrance ticket for The Great Jack O’Lantern Blaze. Forgive me while I nerd out for a second but it was seriously the coolest. There is just that FEELING, I don’t know if I can properly describe it, but the FEELING is when it’s Fall, and it’s nighttime, and perhaps for the first time you realize that while a month ago you were probably sweating in the sun, the first crisp coolness of the air has somehow (when!?) crept into your world. You are aware, for the first time in a long while, of the sound of the leaves crunching beneath your feet. Also there is a cloud partially obscuring an otherwise bright as hell moon. And also Michael Jackson’s Thriller is playing somewhere. 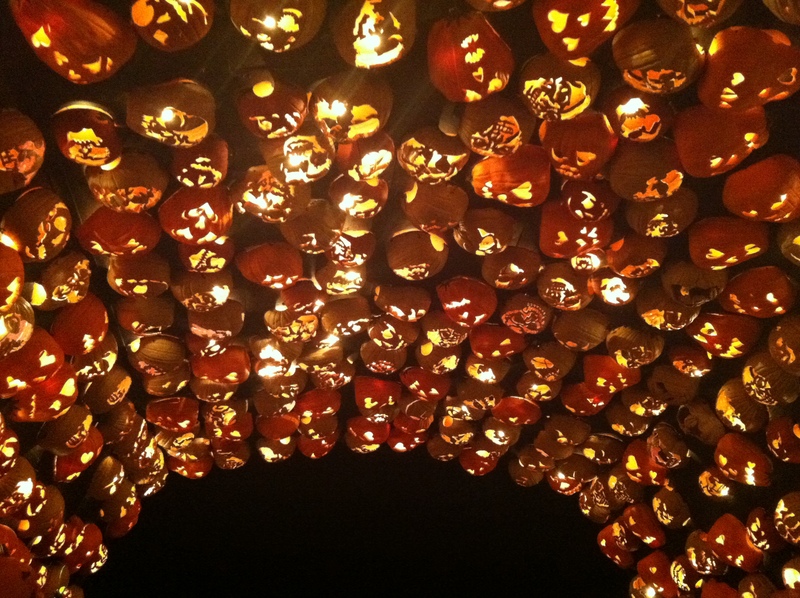 Okay take that FEELING and add 5,000 carved pumpkins because that is exactly what The Great Jack O’Lantern Blaze (henceforth just the Blaze) was all about. I was so excited by the Blaze that I took about a thousand photos before even getting to the good stuff. I will let the photos do the talking. The Blaze is structured as a walk through the property, with pumpkin installations and scenes along the way. Some of the pumpkins were lit with old-fashioned candles, but most seemed to be lit electronically, which aided in some of the show of the spectacle. For instance, upon arriving you will see a beehive, composed of maybe a dozen pumpkins, but all around the beehive are pumpkins carved as bees. 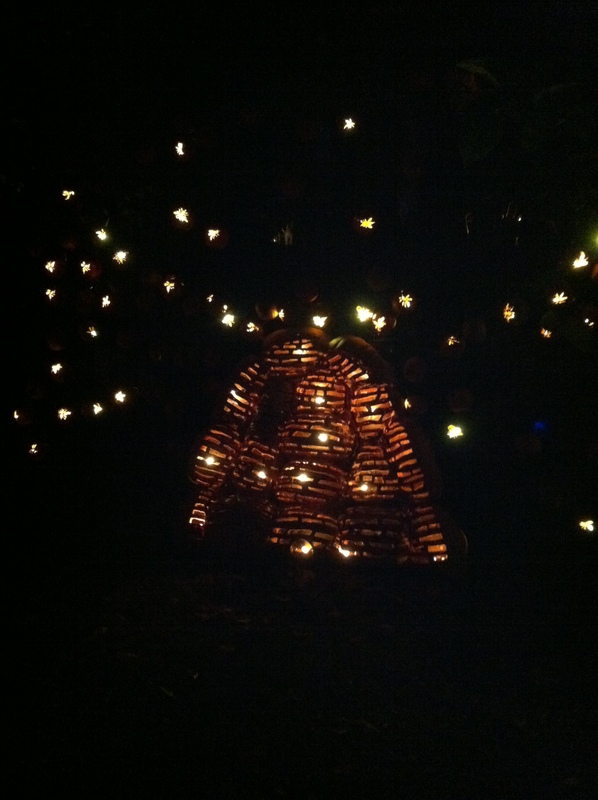 The bee pumpkins twinkle, electronically, giving the effect that bees are flying around the hive. It’s pretty magical. The only real caveat is its popularity. I think the organizers try to limit the number of people who can enter by employing the timed-ticket system, but I still think it was just too many people. But, perhaps I’m bitter because I was stuck walking behind a toddler receiving a piggyback from its father, thus ensuring that its fart stream was directly in line with my nose. Informational signs along the property spew out some pretty mind-blowing (sorry for the cliché, but really) facts. Pumpkin carving for this event begins in June. 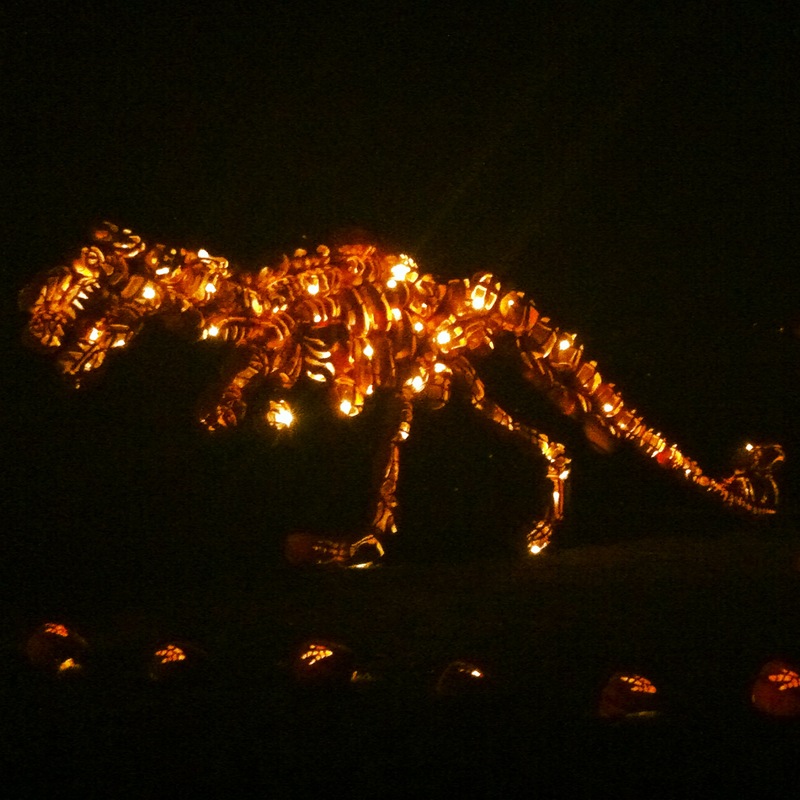 All the pumpkins are hand-carved, on-site. All in all, there are 10,000 pumpkins that will be carved and displayed at the Blaze throughout the month and about 5,000 at any given time (SO MANY POTENTIAL HEADS for the Horseman, am I right). Also worth noting: The Blaze’s FAQ site is hilariously brilliant. Why the pumpkin? “Because it’s orange, round, and there.” I know that the poor pumpkin has become the emblem of certain seasonal hysteria. 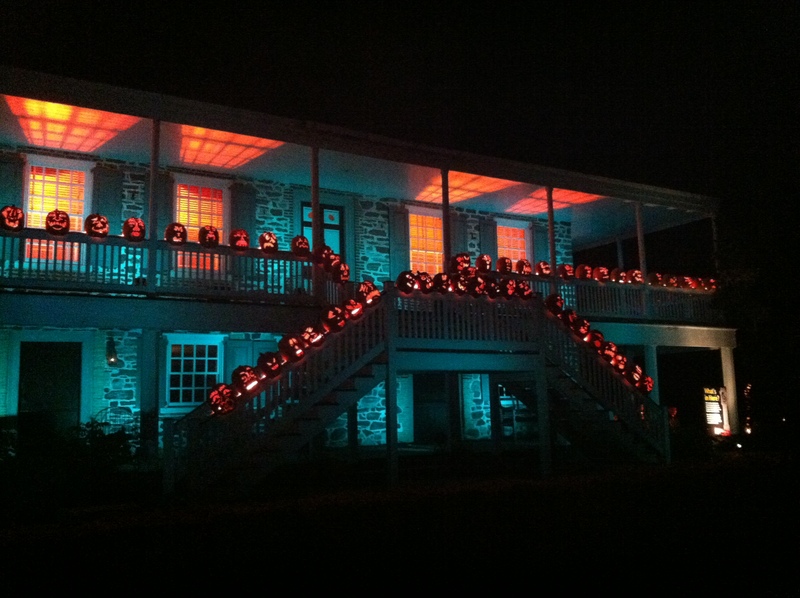 But I take your Pumpkin Spice Latte and raise you one Great Jack O’Lantern Blaze. This event has the highest level of Amanda Seal of Approval and cannot be missed if you are anywhere near the East Coast during the month of October. My favorite installation was the Jurassic Park scene. Are you surprised? Tickets for the Blaze are only $20 and sell out outrageously early, so I highly recommend buying early or putting this on your to-do list for next year. 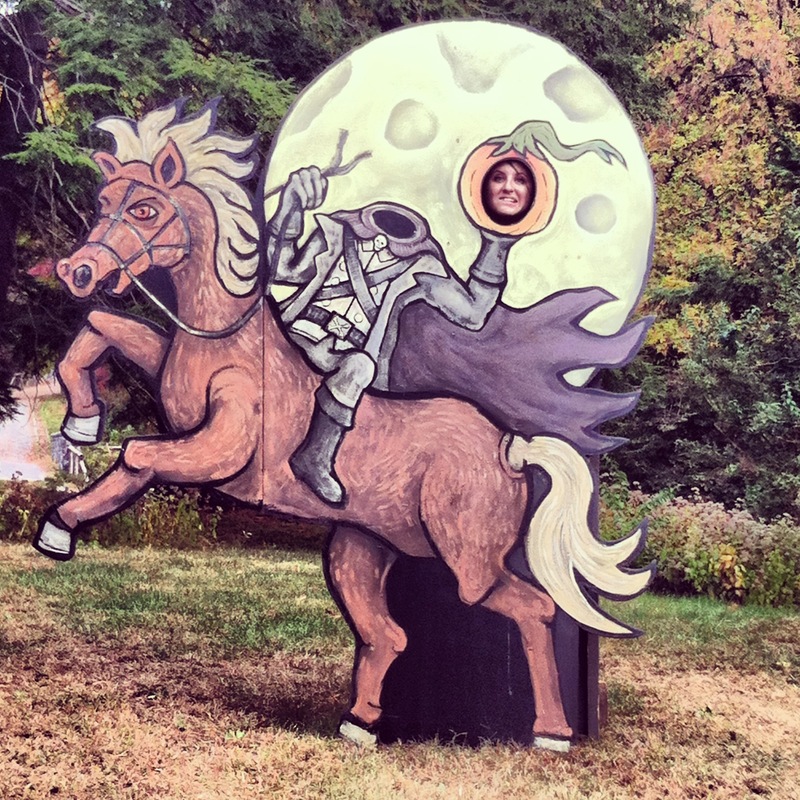 Sleepy Hollow and the surrounding Hudson River Valley is a perfect destination for Halloween travel! Thanks for sharing I love the pictures of The Blaze. Mad a mental note to add this to my future travel must-dos. Yes! It was so so so fun – and I forgot to mention there was a lot of food there too! Fun and lots of food…I’m sold!